last fall i went to hear Rahima Baldwin speak. she encouraged us to imagine our homes as places that support the spiritual path of each member of the family. that’s sounds lofty, but really it hinges on basic things: a sense of reverence and gratitude. she also said it was important to make a place for prayer, an altar. it doesn’t take much, just a little thought and attention. she said the window sill above the sink was a good place. the room filled with laughter. dishes and prayers! but she said it’s a place where we spend time nearly everyday. it’s a place whose repeated motions can free the mind for other work. it’s a place (unfortunately!) where we can be alone. the dishes must be washed. why not invite beauty and prayer in too? so i cleared off the widow sill above the sink. it has a way of collecting odd bits. now it holds a doll from Ecuador, a tiny, silver Virgin Mary, a crow feather, another small icon, shells from San Diego, dish soap,and a succulent from Nicki. now that i’ve listed it all out, it seems crowded. but it’s not. just a quiet place to rest my eye as i wash each day’s sink full of dishes. mmmm….i love the image. 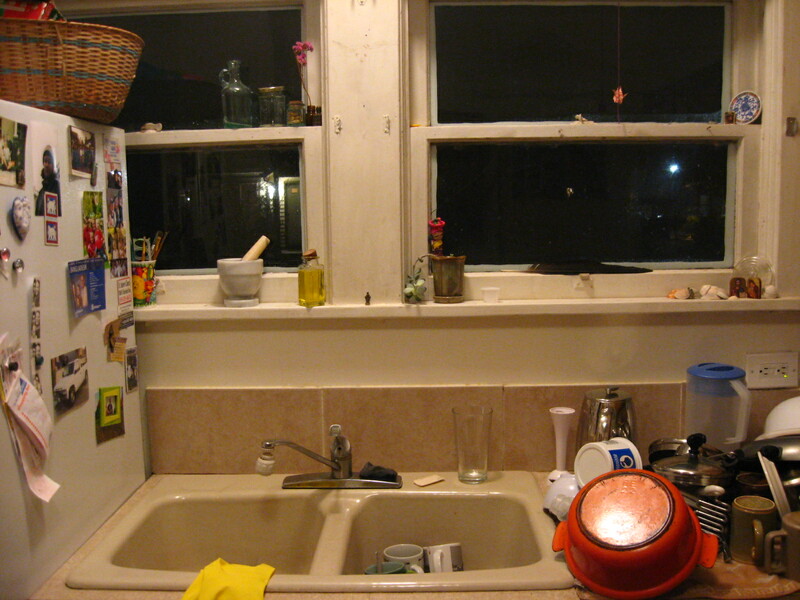 i have no window over my sink, but i wonder if i could fashion a little shelf…i do spend a lot of time facing that little sink. someone gave me a christmas card this year with a painting of Mary and Babe that was so lovely i cut it out and framed it. i leave it on the living room shelf and it has ministered so much in it’s womanly companionship. i’d love to see a picture of your shelf! finally got the picture to load…i think you can see a larger version if you click on the image itself. and tonia, i know that deep solace that comes from the Mother and Child. i feel a deep, abiding connection to Mary since becoming a mother myself. I love Rahima Baldwin! It must have been wonderfully inspiring to hear her give a talk. I love your newest sacred space.